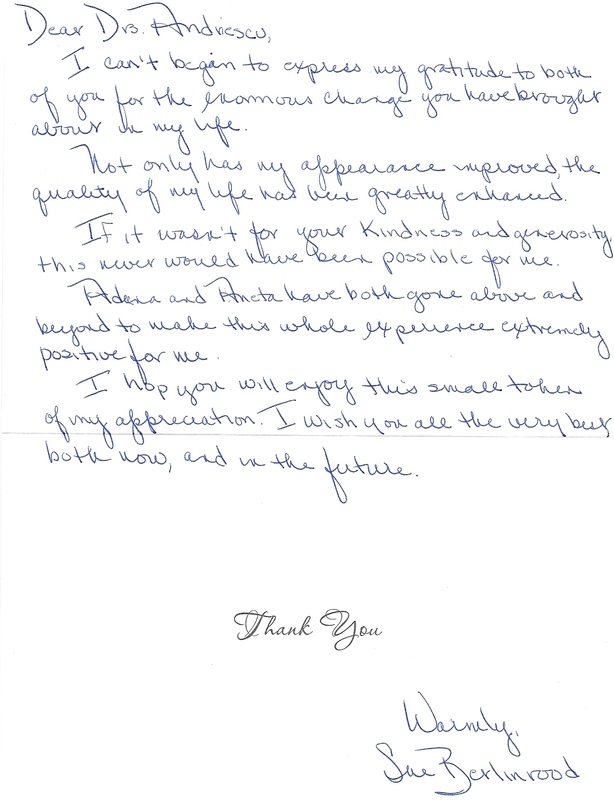 PROSMILES - Testimonials provided by patients all over Bergen County NJ about the doctors. At Prosmiles we deal with patients from all over the Bergen County, New Jersey area, as well as some from further out in NJ, NY and PA. It is important for us to be able to share with you some of the heartfelt sentiments we have recieved from happy and satisfied patients. Should you have something you would like to share on our website please feel free to e-mail us at info@prosmiles.net and we would be happy to post your thoughts along with our other valued patient's. "I generally do not agree to testimonials for the simple fact that I usually do not feel anyone is deserving of one. However, I have made an exception for Dr. Lena and Prosmiles because she has truly changed my life by giving me my smile back. After years of hating my smile and just not addressing the mess in my mouth I thought I'd never be able to smile for a picture again. I was introduced to Dr. Lena by a good friend and decided to put my smile in her hands. I am so thankful that I did because I can honestly say that after only a handful of appointments I LOVE MY SMILE!!!!" "Tears were literally falling out of my eyes when I came back for a follow up visit because I just couldn't believe that Dr. Lena was able to get all the work she promised to get done in just the one sedation visit I had a week prior. I am a nervous wreck when it comes to the dentist and told Dr. Lena she had one shot to make me a believer and she did. After a five hour sedation visit I was out of pain and had a new sense of security in going to the dentist. Unless you are someone like me who knows how it feels to literally shake with anxiety before going to the dentist then you may not be able to understand my sense of joy with this experience, but no matter who you are you can be guaranteed to adore Dr. Lena and the entire office over at Prosmiles."